Easy, cheap credit has created a fantasy world where everyone "deserves" everything right now, and trade-offs and sacrifice have been banished as unnecessary. Debt offers a compelling fantasy: there is no need for difficult trade-offs or sacrifices, everything can be bought and enjoyed now. In the old days when credit was scarce and dear, buying a better auto required substituting 1,000 brown-bag lunches for restaurant meals: yes, four years of daily sacrifice. Sending a child to college meant no meals out (or perhaps once or twice a year), driving an old car, no vacations other than camping, working overtime to make a few extra dollars, summer jobs for every teen in the family and a hundred other sacrifices and trade-offs. All too often, only the oldest got to go away to university; younger siblings had to sacrifice their education for the greater good of the family. If the oldest sibling was fortunate enough to earn a decent salary after graduation, he or she sacrificed to pay for the education of younger siblings. Trade-offs and sacrifices were the core of household finances for those families that sought to "get ahead" or purchase things that required substantial cash. Abundant, cheap credit upended the incentives to make adult trade-offs and sacrifice consumption for future benefits. Why eat 1,000 brown-bag lunches when you can buy a new car for $500 down and "easy" monthly payments? Heck, you don't even need to pay for the lunches with cash; just charge them. Want to go to college? Just borrow the money via student loans. Why scrimp and save when Uncle Sam will guarantee $100,000 in student loans? Why choose between a lavish vacation, a year of college or a boat? Buy all three on credit. This mentality has infected the entire nation and culture. Why should we have to choose between $600 billion military spending and $600 billion Medicare spending? Let's just borrow the $1.2 trillion every year to pay for both. I personally know families that have no savings or assets to speak of, but every summer the parent(s) and kids travel overseas with little effort made to budget-travel. These families earn good incomes but the income is all blown in current consumption: the teens get daily Starbucks and a cafe-bought lunch, dinner is often a sit-down restaurant meal, and all the computer/gadgetry in the household is the latest and greatest: iPhones, iMacs, iPods, etc. I also know young families who are "working poor," where the father earns less than $20,000 a year and Mom stays home with the two young kids--yet they own a much nicer and newer car than I do, and the Federal government gives them over $2,000 a month in cash benefits: $500 Section 8 rent subsidy, $600 in food stamps and $1,000 in free medical care. As a self-employed person, I have to earn $3,000 a month to net the $2,100 this family receives every month, so it's like a magic full-time wage earner slaves away and gives this family his entire earnings. Only there is no "magic worker:" the $3.8 trillion the Federal government distributes every year is two-thirds tax revenues and one-third borrowed. To the degree that our government distributes $1.3 trillion in borrowed money every year, everyone receiving money from the Federal government is living off debt that draws interest and will never be paid. Thus it is an artifice to say that a person collecting money from the Federal government is "debt-free": the debt they are incurring is simply once removed. Credit leverages income. If $10 per month in disposable income can leverage $100 in debt, then if disposable income rises to $20 per month, debt can be doubled to $200. Lowering interest rates increases leverage. If the interest rate is cut in half, $10/month can leverage $200 in debt. We are now at the end-game of these two expansions of leverage: incomes are no longer rising, and interest rates have been cut to near-zero when adjusted for inflation (a.k.a. loss of purchasing power). Relying on credit to fuel "growth" in everything only worked when incomes were rising and interest rates could be cut. Now that incomes are stagnant for 90% of the populace and interest rates have been slashed, there is no way to increase leverage. Here is a chart of adjusted real income. Note that it has been stagnant for the "bottom 90%" for the past 40 years. The savings rate has plummeted; the brief spike up in savings triggered by the global financial meltdown has already faded. U.S. households save a mere third of what they once put aside. Note that the savings rate is not broken out by income; the bottom 90% probably save very little, and the top 10% is probably responsible for most of the savings. 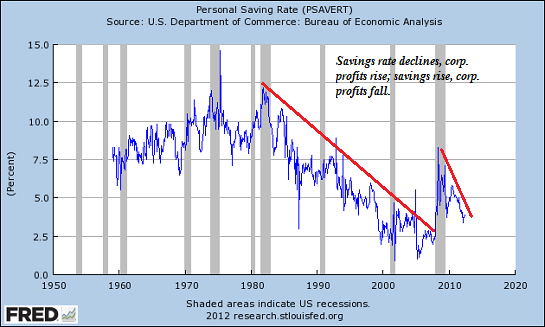 So the "real" savings rate of the bottom 90% households is likely much lower. 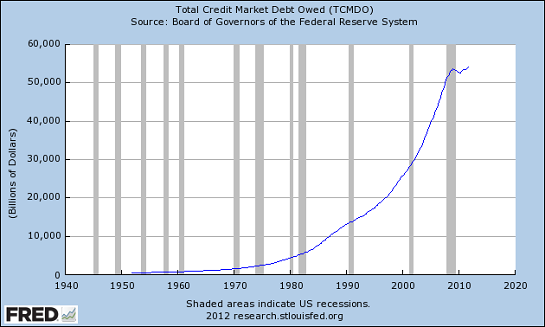 Here is "total credit owed" in the U.S. If income is flat and interest rates already near zero, then where is the leverage for additional debt going to come from? The answer is the game of relying on ever-expanding debt is over. You can claim phantom assets and income streams as collateral for a while, but eventually the market sniffs out reality, and the phantom assets settle at their real value near zero. Once the collateral is gone, the debt is also revalued at zero, and the debtor is unable to borrow more. This is the position Greece finds itself in; the collateral and income steams have been discounted, the credit lines have been pulled, and so the reality of living within one's means is reasserting itself. Living within one's income (household or national income) requires making difficult trade-offs and sacrfices: either current consumption is sacrificed for future benefits, or the future benefits are sacrificed for current consumption. You can't have it both ways once the collateral and credit both vanish. Thank you, John and Grace ($50), for your immensely generous contribution to this site-- I am greatly honored by your longstanding support and readership.